Good brushes really do make all the difference when I'm applying my make-up. And I'm really quite particular about my brushes. They need to be super soft because I've got sensitive skin, they need to be shaped correctly for the purpose that I plan to use them for, they need to not shed when I use them or wash them and of course I want them to be cruelty-free. Because of this my go to brand tends to be Ecotools. They're fairly easy to get ahold of here in Canada, they're reasonably priced, they're sturdy and the are completely cruelty-free with 100% synthetic bristles. One of the nice things about synthetic bristles is that they don't hold bacteria as easily as natural hair brushes do. They still need to be washed of course, as any product build-up can harbour bacteria but it's still a bit of piece of mind for me at least- especially as I don't wash my brushes as much as I should! My first set of brushes are mainly used for my face. 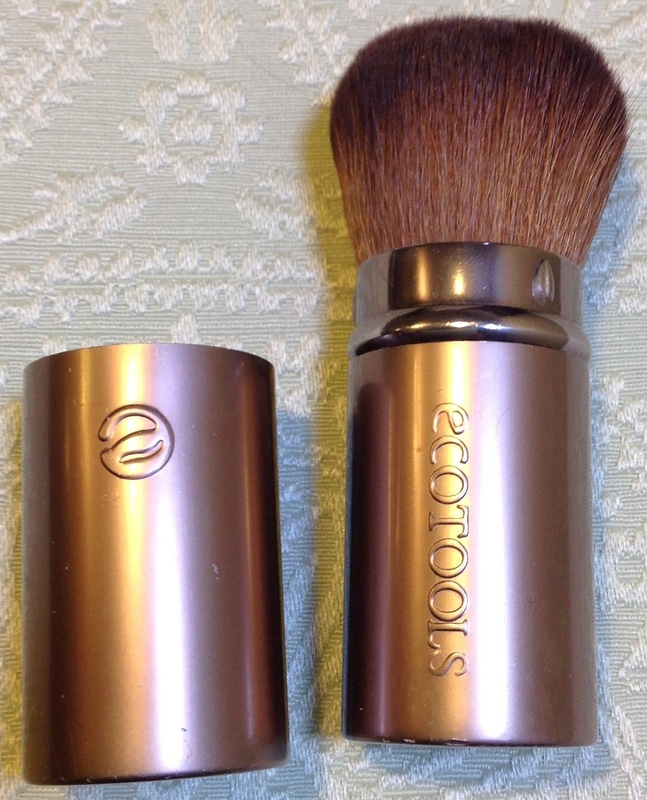 Above is my retractable kabuki brush from Ecotools and the only brush I use to apply my powder foundation. I love this brush and use it just about every time I do my make-up. It's thick, soft, doesn't ever shed, spreads and buffs powder products well and on top of all that is perfect to travel with as it retracts into the metal case so that none of the bristles are at risk of being bent. 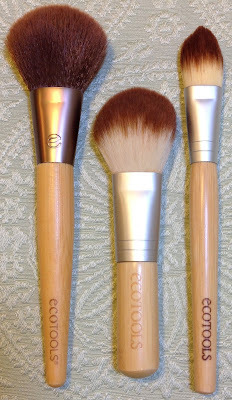 The next two brushes (the two left) are both from different Ecotools' sets and are both meant to be either blush brushes or all over face brushes. I use the smaller of the two (middle) exclusively for blush application and the right one for both loose finishing powder application and blush. They're a little different in shape from one another but both work well. I wouldn't buy them on their own but I'm glad they came with some of the other brushes in a kit. The nice thing about the kits is that they usually come with a travel bag for the brushes too. The paddle foundation brush above (right) also gets a lot of use when I have a liquid foundation as this shape of brush is my preferred application method. It's thick enough that it blends the product well while small and flexible enough to get into the crease around my nose. These next brushes I use entirely for eyeshadow application, even the brush on top which came advertised as a concealer brush. As you can tell I tend to use multiple ones at the same time so I don't muddy the eyeshadow colour I'm applying. These are easy to swipe clean on a kleenex between shades too, so I tend to use them nearly every time I apply eyeshadow. Some of these I received as part of a brush kit and some I purchased separately. This brush again was part of a kit but I love how fluffy it is! Though tiny it's great for applying a setting powder to under-eye concealer or to blend out any harsh lines of a shadow. It's even good for applying a shadow lightly in the crease of the eye. Please ignore the dent in this last one, it's been well loved. I adore my angled liner brush from Ecotools. It has long stiff bristles, and the slant is perfect. I use this to do fill my eyebrows with brow powder, put eyeshadow along the bottom lid of my eye, do detail work in the outer-v, and apply gel or powder eyeliner. Such a great brush. So this is my rave about my Ecotools brushes. I love them as you can probably tell. I only wish they had a pencil brush I could use in my crease available as an individual brush, though I have seen some in the newer brush kits that are out. You can get Ecotools at a variety of stores here in Canada, some of which include: Walmart, Rexall, London Drugs, Pharmasave, and they've been spotted in some Costco's. Online they're available through iHerb as well. In the USA they're avilable through Target and Walmart. I'm sure they're avilable at most standing stores as well, I just don't know which ones as I don't live there. Remember if you order online to always check out retailmenot for coupon codes and use ebates at most major websites (like Target). 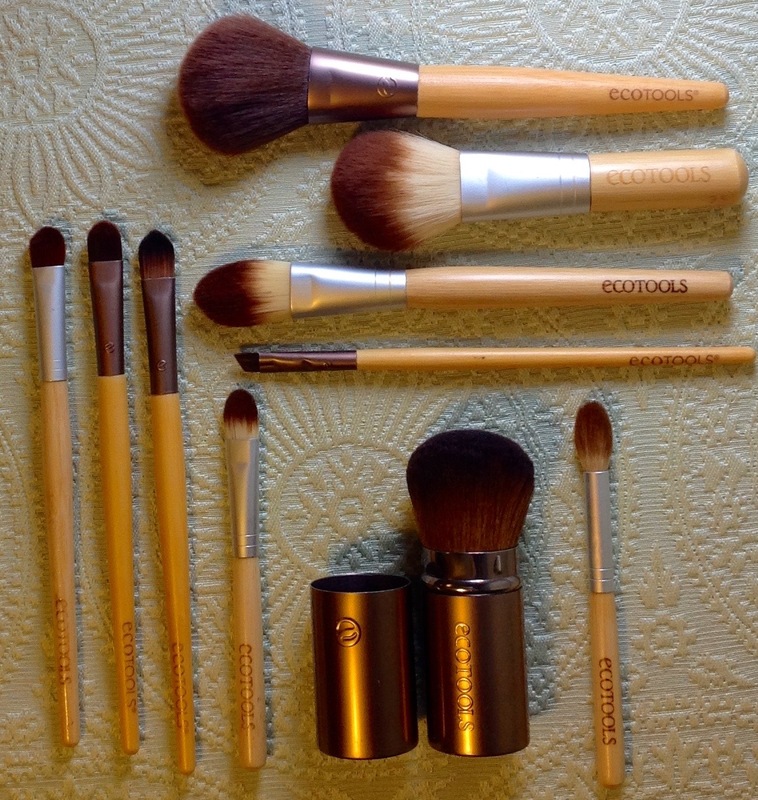 I hope you found this break down of some of my favourite Ecotools brushes useful! Take care until next time. Disclaimer: All products in this post were purchased by me. The only affiliate link in the post is the ebates links.